First you have to install the software, can be downloaded in here. 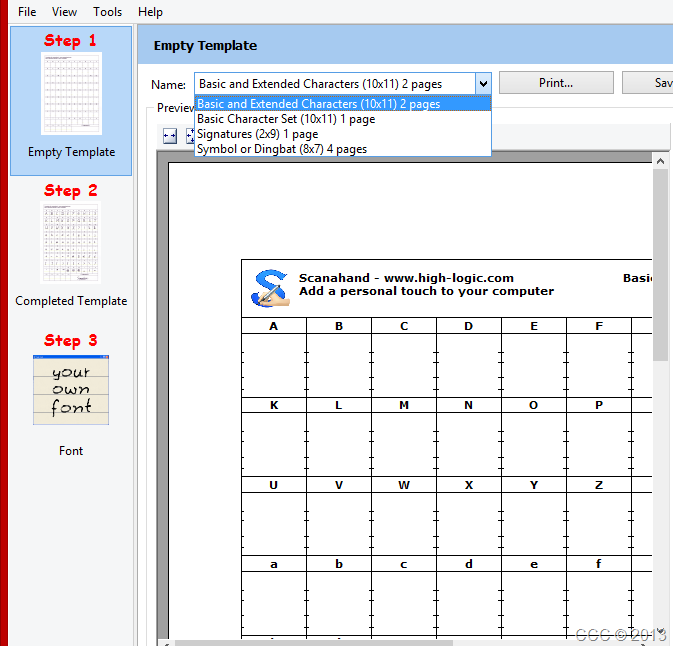 Open the software and choose Step 1, Empty Template. If you don’ t have tablet to input your handwriting, you have to write it on paper. Please write all the characters in the template, preferably by pen or ink if you want to make it all nice, you can write it on straight line with ruler. If you want to make it more realistic, you can just write the character inside the box, as crooked as it is. After you fill all of them and satisfied, follow next step. After all’ s finished, scan both template. 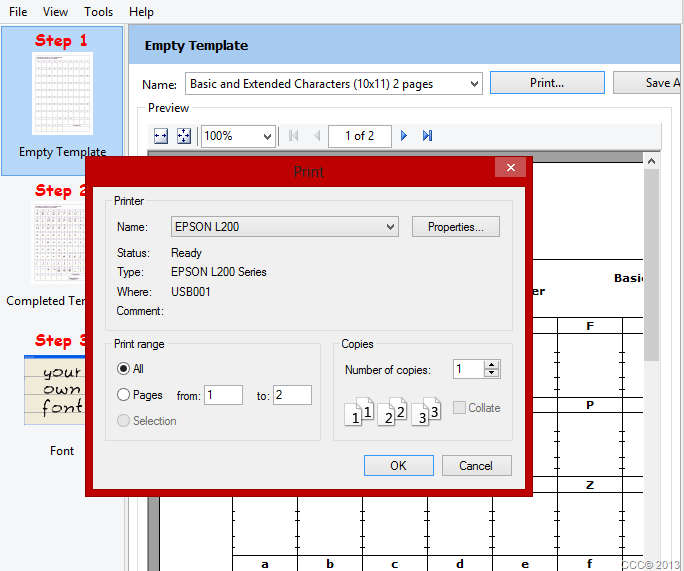 You can do it by scan the printed templates with your writing directly to the software or load the image file. I do it the second way. Open the software, load the first image to page 1 , and load the second one to page2. Moving to Step 3, Font. Click Generate. In Font Setup, type your Font Name and it’s copyright. 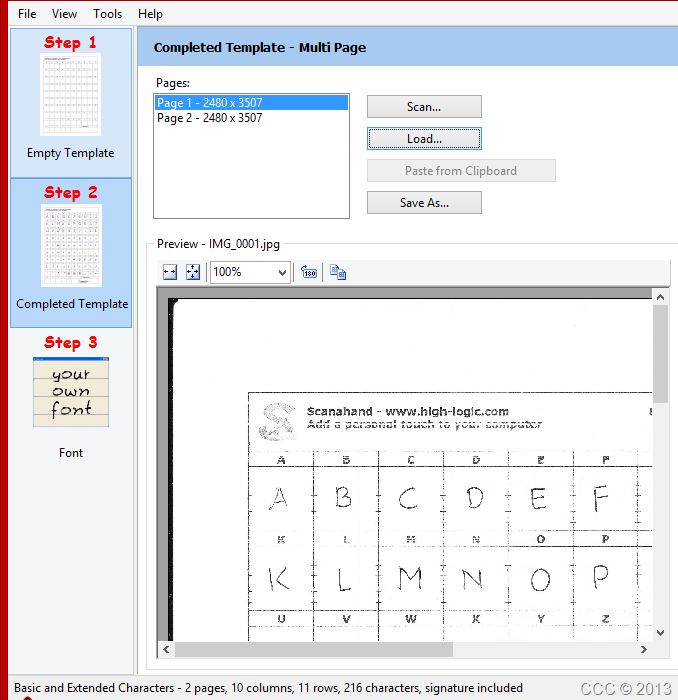 After you finish all of the step, you can edit the result character by character, using FontCreator. if you are satisfied, you can save the font or directly install the font. For naming your own font, you can just go to literal way like my font or something font-like, like mine is Crimsonglyph. After you finish, you can install your font in every computer you want and just use it. Other than your own font, you can just make decorative fonts easier (but the result will be better if you make it from scratch in computer using other software). That’s it. Simple. Personal. How about your font? What name you put for it? Posted on July 13, 2012, in Making, Plugging, Teaching and tagged creating, design, font, highlogic, scanahand, software, tutorial. Bookmark the permalink. Leave a comment.